October 5, 2006: New Concrete Images Site Online. July 21, 2008: Site Updated with Flash Galleries. More Updates to come! December 9, 2008: New Photo Galleries, and New Photos! Welcome to Concrete Images on the Web. Concrete Images Inc. is a Minnesota-based custom concrete company which has been changing the face of the Twin Cities suburbs since 1992. 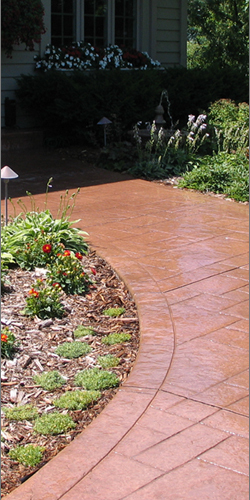 We specialize in stamping, exposed aggregate, and broom finishing on steps, sidewalks, driveways, patios, pool decks, etc. Each image is created based on the desire of the owner, making no two homes alike. This originality gives homes an indefinite style and sophistication, matching only those whom reside within. We currently serve the Twin Cities and St. Cloud areas, as well as South-Western Wisconsin. Feel free to browse our site, or contact us for more information about what we can do for you and your home. This site is best viewed in 1024x768 resolution or greater. About Us | Site Map | Contact Us | ©2003 Concrete images Inc.